The JU650D is the wholesale club (i.e. Costco, Sams Club model number). There are no notable features changes. The major difference in the JU6400 series is 3 HDMI inputs for that series. The JU6500 4K LED TV from Samsung is best priced 4K offerings from Samsung but still has ample some good features like Smart TV offerings, UHD Picture Dimming, a quad core processor, HEVC 4K streaming decoding, and a contrast enhancer. Though the 6500 has 4K UHD resolution, it rivals 1080p TVs of the same size from a year or two ago in price, one of its best features. 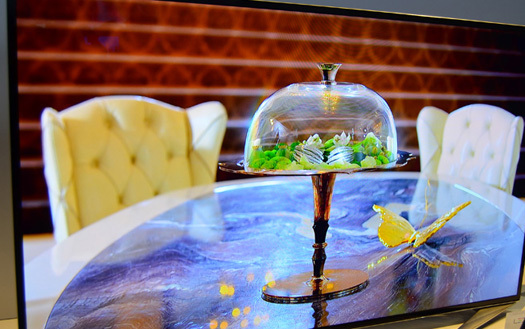 "Samsung's clear coat screen on the JU6500 allows rich, accurate color"
As we've mentioned many times before, edge lit LED backlit LCDs are not the ideal picture technology (even in 4K), however Samsung's clear coat screen is a big plus. Images are clear and color information is accurate. Over time, some light bleed is likely to occur – noticeable during very dark or black background scenes. 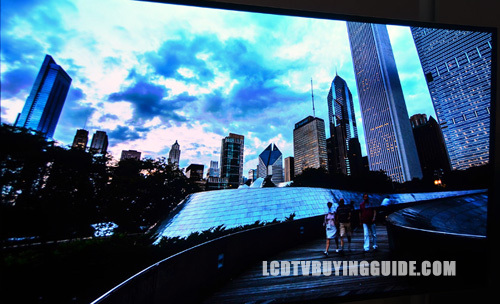 Colors pop very well for an LED TV and Samsung has the brightest LEDs (peak Whites) in the industry if you need a very bright screen. The ultra clear panel technology in this screen which helps to absorb ambient light is an excellent feature. Last, the JU6500 includes a wide color enhancer plus technology for an expanded color pallet. Color and contrast look wonderful on the JU6500. "We give the JU6500 an average score in upscaling conversion to 4K"
Ever wonder if the picture quality is better on a 4K UHD TV with a standard definition or HD signal pumped into it? The answer is yes ONLY if the TV has a stellar upscaling and conversion technology built in. We give the JU6500 an average score in this category. The JU6500 analyzes the incoming signal, applies video noise reduction techniques, and scales up the lower resolution signal. Lastly, it enhances the detail which may be the most important bit. With HD signals the JU6500 upscaler did a passable job improving the picture quality detail by 30% or so to attempt to put a number on it. This is one of the key differences between some of the higher priced 4K TVs, the upscaler technology employed is more robust. 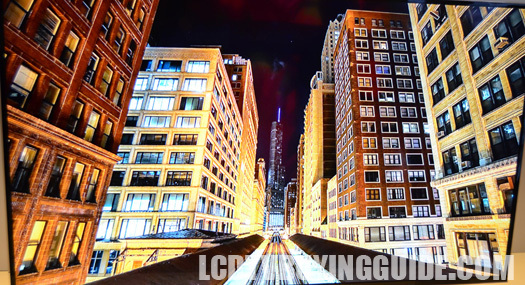 The light flow through created by the Samsung LED backlights has been a major positive for the last couple of years and continues with this UHD offering. It's one of the TVs best characteristics. Some complain that it can cause screen uniformity issues. To tone down the LED backlight from causing some uneven screen uniformity issues turn the backlight setting (found in the picture settings menu) down to a more reasonable level – around 80% is what we recommend. This will keep screen uniformity issues from arising and you still have plenty of brightness from this super bright LED TV. Having powerful LED backlighting in case you need it for super bright room conditions is a plus. Color and contrast do fade when viewing from off center though much more subtly than I expected. In fact, the untrained eye will likely not see much difference in contrast saturation until extreme angles. Early models of the 4K TVs from Samsung did not look this good from the side and were more in line with standard HD LED TVs. Don't get me wrong, it's still a drawback, but not a pronounced one. This was probably the single biggest drawback compared to OLED aside from the deeper blacks and richer colors on OLEDs. "If fast action sports programming is important to you, consider a higher refresh rate panel"
The native panel refresh rate is only 60Hz for the JU6500 so you will see some judder on those movie scenes with side to side panning. The backlight manipulated Motion Rate is 120. This is another compromise for a lower price. If fast action sports programming is important to you, consider a higher refresh rate panel of 240Hz. You will likely notice the motion lag in fast moving scenes from movies and sports on the JU6500, especially in the larger size screens of 60” and up. The Auto Motion Plus feature in the JU6500 is something that comes as a blessing and a curse. By default it is set to On in all of the preset picture setting modes. You should turn it off for streaming content, DVDs, Blu-rays, and TV shows. You end up with the dreaded 'Soap Opera' effect, making images look terribly unrealistic by eliminating natural background blur. Turn it off in the Picture Options menu and everything will be fine again. You'll immediately see judder when you disable it, but your eyes will adjust momentarily. We've noticed that it actually helps when it comes to displaying 3D content and sports programming. When viewing 480i based content we saw slight improvements when the setting was low as well. Just be familiar with how to adjust this and it won't be a problem. The JU6500 does not get the new Tizen OS Smart Hub of the top JS models, but instead gets a similar Smart Hub suite to last year with the same basic design. Samsung hit the mark with their user interface and intuitive navigation. This time around you will see the Game tab as one of the major smart TV pages. The On TV page allows for individual logins. This means different members of the family can have different recommendation settings. This is a big plus for a home with multiple TV users. The Smart Hub for the JU6500 includes a full web browser. The quad-core processor greatly increases the speed of the Smart TV function and browsing. It is a welcome addition since processing speed and multitasking were slow before the upgrade to the quad-core. The JU6500 has a nice design with a think half inch border charcoal black matte frame surrounding the screen. The screen is 2.5” in depth so plenty thin for wall mounting. It's no knockout design, but I like thee lines of the new stand. Sound quality we will get back to later, but the speaker package is two by 10W speaks with no subwoofer. The HU6500 is DirecTV ready for 4K content. The TV has built in Wifi, and plenty of HDMI inputs (4) and 3 USB inputs. It also has mobile to TV mirroring and a Game Picture Mode for gamers. 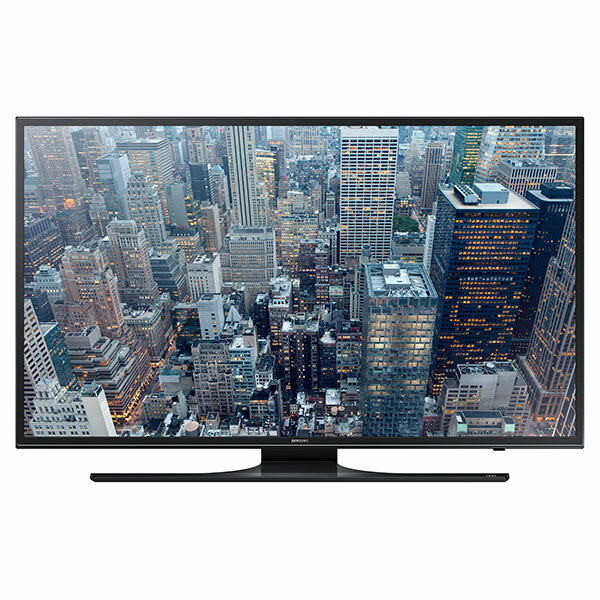 As one of the lowest price Samsung 4K TVs this year, value is an important aspect of the UN65JU6500. At around $2100 we think this is an exceptional value offering. It has most of the “stuff you really need” and even has the ultra clear coat screen, contrast enhancer technology, UHD dimming, and DirecTV ready for 4K. However, the 60Hz processing gives us pause in the larger size screens especially. It does not have a touchpad remote even though there are free apps available to use your smart phone as the remote. Other notably absent features are 3D, and a high end upscaling package. TV without stand (W x H x D): 57.6" x 33.2" x 2.5"
TV with stand: 57.6" x 35" x 12.5"
Weight without stand: 52.2 lbs. Weight with stand: 60.6 lbs.